100 ton gantry crane is a perfect lifting system for heavy lifting applications such as port, construction site, railway, shipyard and freight yard to handle bulky materials. This heavy duty gantry crane is typically designed with double girder structure so as to be able to lift extremely large and heavy loads. The 100 ton crane produced by Ellsen is adaptable for both indoor and outdoor uses, achieving a wide range of applications. With rich experience of gantry crane design and manufacturing, we always provide superior quality products and best service for clients. The 100 ton gantry cranes are available in multiple sizes, models and forms to fit different working environments and applications. Our sales team and engineers can work with you to design a lifting solution that best serves your needs. As a heavy duty lifting system, 100 ton gantry crane is capable of lifting and moving heavy loads up to 100 ton. 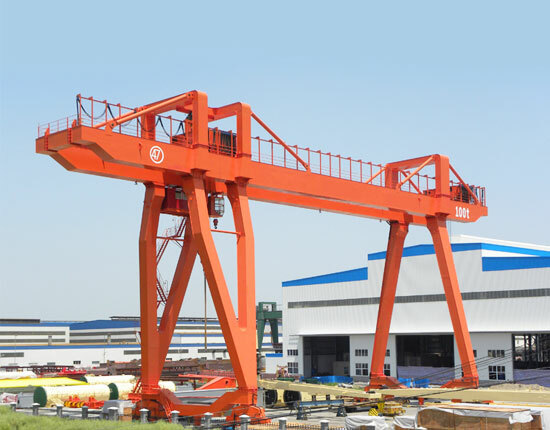 We produce many different types of gantry cranes to meet specific needs of clients, mainly including A frame gantry crane, U frame gantry crane and mobile gantry crane. The MG double girder gantry crane is suitable for 100 ton lifting needs as the capacity is usually in a range of 5 ton to 200 ton. 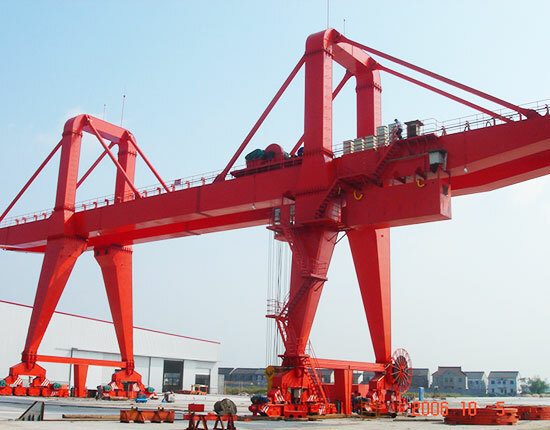 It is a typical A frame gantry crane and also the most commonly used type in various industries. 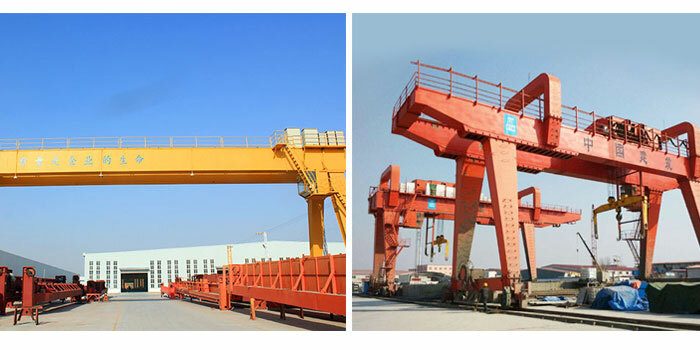 The 100 ton double girder crane is widely applied in open freight yard, railway and quay for general lifting purposes. According to different lifting needs, the 100 ton gantry crane can be designed with or without cantilever. In addition, this gantry lifting equipment is available in box and truss structure to fit different working environments. For instance, truss gantry crane is ideal for strong wind environment as it can reduce wind resistance. This type of gantry crane 100 ton has advantages of high efficiency, strong versatility, high utilization and great adaptability. 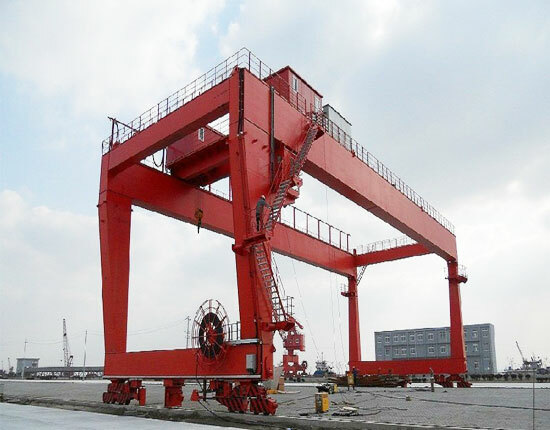 The U frame gantry crane is an ideal lifting system to handle large sized loads such as containers. 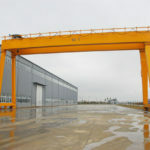 Compared with A frame gantry crane, this 100 ton gantry crane provides larger space between the two legs, thus it is able to lift and move heavy items to the end of the cantilever. 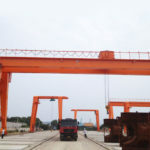 Traveling on rails of the ground, the U type gantry crane is adaptable for a large variety of applications such as shipyard, ship to shore and port. As a newly developed lifting system, the mobile gantry crane is increasingly popular in many industries for its high mobility. It is usually equipped with rubber tires at the bottom to achieve a convenient movement. 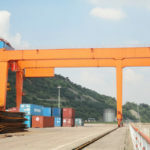 The rubber tyred gantry crane is suitable for many outdoor workplaces, especially applied in port and container terminals to handle stack of containers. This type of gantry crane has remarkable features including high flexibility, easy installation, convenient relocation, stable and durable performance. If you are looking for a flexible lifting system for your heavy lifting needs, portable gantry crane can be your first choice. In addition to the above types of 100 ton cranes, we provide other kinds of equipment to fit different environments, such as semi gantry crane. To know more detailed information about 100 ton gantry crane, contact our sales team online now. We can help you find the most suitable material handling solution for your specific application. Our 100 ton gantry crane is developed with optimized structure and performance to help promote productivity for customers. It can brings great benefits to users. With solid construction, this 100 ton gantry crane can realize a stable and durable performance. The adoption of reliable and sensitive protection devices helps improve safety as well as effectively prevent accidents. Reasonable structure and quality materials provide a safe and reliable operation. The 100 ton gantry crane is highly adaptable for various fields, and has simple installation and maintenance. Custom design is provided to meet special needs of customers. It is essential to ensure a safe use during gantry crane operation for that it is not only related to the efficient operation of the equipment, but to the safety of personnel. Therefore, it is necessary to take several measures to ensure safety as well as improve productivity. Safety devices are indispensable parts of gantry lifting equipment in order to prevent accidents, which mainly includes overload limiter, lifting height limiter, interlock protection device, buffer, wind proof device, anti-collision device, alarm system and more. When it comes to outdoor workplaces, the rain cover and lightning protection device are also necessary to ensure a secure operation. These protection devices should be inspected regularly to make sure they are in good working conditions. In case of components malfunction, they should be maintained or replaced timely. Besides, the crane operators should be rigorously trained on the equipment knowledge as well as strictly follow operation manuals. The 100 ton gantry crane is usually operated by wireless remote control, cab operation or the combination of the two. Each operation method has its own advantages and disadvantages, so you should choose according to your practical use. 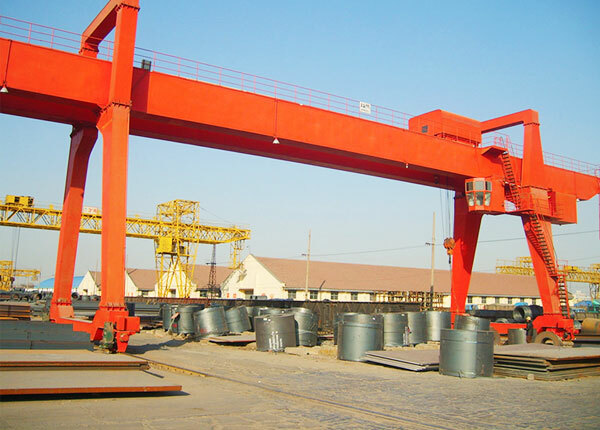 Ellsen machinery has specialized in fabricating gantry crane for more than 10 years. We supply both small gantry crane and heavy duty gantry crane ranging from 1 ton to several hundreds of tons to meet a variety of lifting needs. Our products have been exported to over 80 countries and regions, realizing a stable growth year after year. We have earned good reputation from clients by ways of providing quality products and best service, and aim to create maximum value for them. We are not only responsible for the gantry crane design and manufacturing, but for the follow up services including delivery, testing, commissioning, installation and maintenance so as to ensure a smooth running and prolonged working life. If you would like to buy a 100 ton gantry crane or other types of heavy duty gantry cranes, you can contact us directly. We are willing to work with you in the near future!